For those of us who don't have time to cut up or cook fruits and vegetables with every meal, juices and smoothies are a fast and easy way to consume them at home or on the go. Packed with over 100 recipes, Juicing & Smoothies For Dummies covers the most up-to-date information on incorporating this healthy lifestyle into your everyday routine. From how to safely cleanse the body of toxins to the hottest ingredients to bolster juices and smoothies—including chia seeds, coconut oil, hemp seeds, bee pollen, and more—it arms you with everything you need to sip your way to a healthier, happier you. There are many health benefits to drinking freshly juiced fruits and vegetables. These tasty and nutrition-packed beverages can help protect you against cardiovascular disease, cancer, cellular damage, and various inflammatory diseases, such as rheumatoid arthritis. Plus, it's great for weight loss because juices and smoothies have hunger-reducing properties, on top of being filling. In this friendly and accessible guide, you'll find expert guidance on how to use juices and smoothies to reap all of these excellent rewards, while getting the recommended daily amount of fruits and vegetables—in a glass! 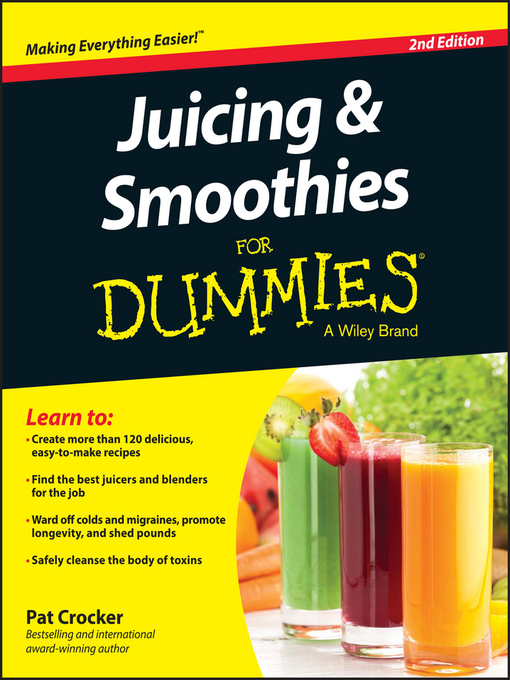 Whether you want to lose weight, cleanse, or simply add more healthy fruits and veggies to your diet, Juicing & Smoothies For Dummies makes it easy.